Sept. 21 (UPI) -- Hurricane Maria, the 15th tropical depression this season, is now battering the Caribbean, just two weeks after Hurricane Irma wreaked havoc in the region. The devastation in Dominica is "mind-boggling," wrote the country's prime minister, Roosevelt Skerrit, on Facebook just after midnight on Tuesday. The next day, in Puerto Rico, NPR reported via member station WRTU in San Juan that "Most of the island is without power...or water." In this region, disaster damages are frequently amplified by needlessly protracted and incomplete recoveries. In 2004, Hurricane Ivan rolled roughshod through the Caribbean with wind speeds of 160 mph. The region's economy took more than three years to recover. Grenada's surplus of $17 million became a deficit of $54 million, thanks to decreased revenue and the outlays for rehabilitation and reconstruction. These are not isolated instances of random bad luck. As University of the West Indies geographers who study risk perception and political ecology, we recognize the deep, human-induced roots of climate change, inequality and the underdevelopment of former colonies - all of which increase the Caribbean's vulnerability to disaster. Disaster risk is a function of both a place's physical hazard exposure - that is, how directly it is threatened by disaster - and its social vulnerability, specifically, how resilient it is. Haiti, where 8 of every 10 people live on less than $4 a day, offers an example of how capitalism, gender and history converge to compound storm damage. The country is among the Western Hemisphere's poorest in large part because of imperialism. 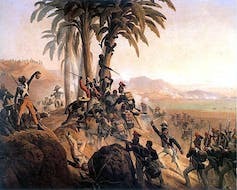 After Haitians successfully overthrew their European enslavers in 1804, global powers economically stifled the island. From 1915 to 1934, the United States first militarily occupied Haiti, and then followed a policy of intervention that continues to have lasting effects on its governance. In such a context, disasters aggravate a country's numerous existing social vulnerabilities. Take gender, for example. Mental health professionals offering support to victims after Haiti's 2010 earthquake found that an extraordinarily high number of displaced women - up to 75 percent - had experienced sexual violence. This prior trauma exacerbated the women's post-disaster stress responses. For the poor, emergency radios and satellite telephones that could warn of impending disasters are largely unaffordable, as is homeowners' insurance to hasten recovery. Even in post-disaster settings, women are expected to perform household labor. So when water supplies are contaminated (with sewage, E. coli, salmonella, cholera, yellow fever and hepatitis A, among others), women are disproportionately exposed to illness. Politics, too, play a role in how the Caribbean is faring during this tumultuous hurricane season. Longtime colonial rule isn't the only reason Caribbean societies and ecosystems are now so vulnerable. When storms threaten, such policies and practices intensify the Caribbean's societal and ecological risks. In practice, this means identifying their most vulnerable communities and working to improve their day-to-day well-being - not just their survival in a storm. The Caribbean's own Frantz Fanon (1925-61), from the island of Martinique, recognized these complexities in his book, The Wretched of the Earth. Fanon asserted that democracy and the political education of the masses, across all post-colonial geographies, is a "historical necessity." Presciently, he also noted that "the soil needs researching, as well as the subsoil, the rivers, and why not the sun." As the Caribbean looks for solutions to the damage and suffering brought on by both nature's revolt and social inequality, Fanon's words seem like a good place to start. Levi Gahman is a lecturer in radical geography and critical development studies andt Gabrielle Thongs is an assistant lecturer in the geography department at The University of the West Indies: St. Augustine Campus.